This week we had a bake sale at work in support of United Way Toronto. I took in some salsa (how could I not?) 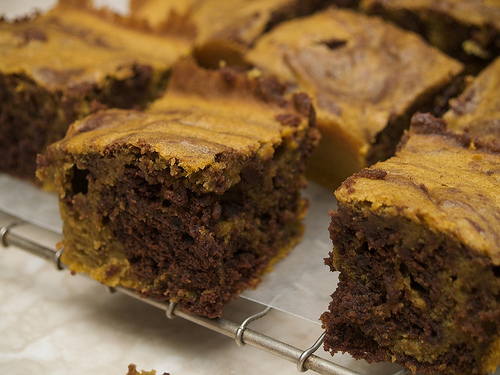 and baked up some of Smitten Kitchen’s Pumpkin Swirl Brownies. These were a little more work than I was expecting. I think I over whipped the batter base, and then when I combined half of it with the chocolate, it really started to set fast, so I had to work super quickly. 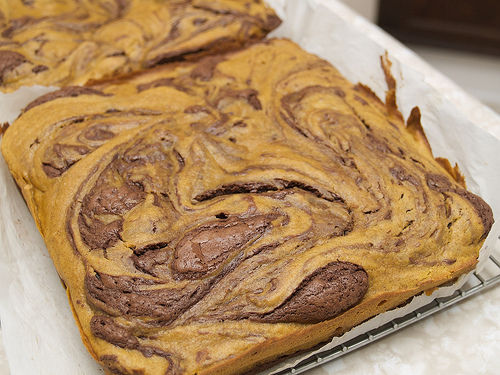 I made a double batch too, which meant I had a lot of batter to put into each pan and swirl together. The recipe calls for ‘solid pack pumpkin’ which I don’t really know what that means, but I just used canned pumpkin puree. The recipe is American so maybe they call it something different down there. Anyway, despite the work, they were SUPER yummy and eleven plates of four brownies each sold like hotcakes at the bake sale. I’ve had lots of compliments since! Preheat oven to 325 degrees F. Line a large-rimmed baking sheet with parchment or butter lightly. Combine popped corn, nuts and pepitas in a large bowl, big enough for tossing. Combine sugar, corn syrup, rum and butter in a small saucepan. Bring to a boil over medium heat, stirring until sugar is dissolved. Then raise heat to high and boil rapidly, without stirring, for 5 minutes (to make the caramel). Remove from heat and stir in salt, baking soda and chili powder. 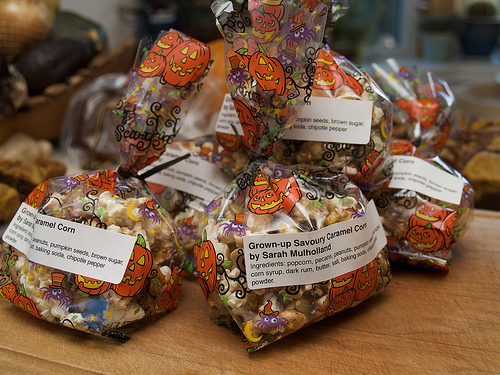 Quickly drizzle the caramel over the popcorn and nuts and toss together immediately (mixture will solidify quickly). Spread into the baking pan. Bake, stirring twice, for about 15 minutes or until mixture is glazed and nuts are toasted. Let cool slightly. Break into chunks and let cool completely. Place in decorative bags and seal tightly. Store at room temperature for up to three days. Oh the brownies look so yummy!